With the controversial Canadian harp seal hunt about to begin in earnest, debate rages as usual and once again, the debate is long on emotion and short on facts. Seen as a tug-of-war between environmentalists outraged by images of bloodied seal pups and pragmatists defending the livelihoods of Newfoundlanders, most discourse tacitly assumes that the hunt, although perhaps inhumane, generates needed profits. This is only half true. Before getting into the economics of the issue, it should be noted that the term â€œhuntâ€� is a gross misrepresentation of what transpires on the Newfoundland ice floes. 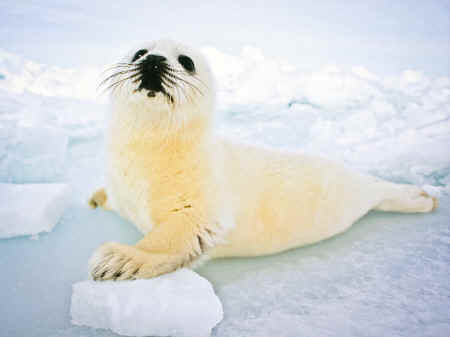 Hunt implies that the animal has some chance of getting away, and, as anyone who has seen video of the harp seal hunt knows, this is the same type of hunting that happens to pigs in slaughterhouses, or to fish in barrels. The occasional descriptions of it as a harvest defy comment. Ethical considerations aside, letâ€™s consider the ubiquitous claim that the hunt is an important source of revenue for Canadian communities â€” â€œtremendously valuable,â€� as the Department of Oceans and Fisheries puts it. It is certainly true that the hunt generates some money for each of the six-to-seven thousand Canadians who spend roughly 125 hours sealing every year. It is also true that the public subsidies which support the hunt â€” in the form of free ice-breaking services, extensive search-and-rescue operations, and international marketing campaigns â€” are nearly equal to, if not in excess of, the total revenue derived from it in any given year. When public expenditures are factored in, the hunt barely breaks even â€” it may even lose money, and that is according to conservative estimates made before the European Union banned seal products in 2009, driving down the price of pelts even further. With the Russian Federation recently enacting a similar ban, this tremendously valuable industry will almost certainly be costing the taxpayer more money than the sealers are making from it. To hell with them! But not with their millions of dollars in subsidies: not with their free icebreaking ships, rescue helicopters, and international lobbying. In short, â€˜weâ€™ll take their money but not their morals.â€™ The truth behind all the bluster is that no one has to tell sealers to give up the hunt â€” all we have to do is stop paying for it. If sealers are not allowed to socialize the costs of their business while privatizing the profits, they will give up the hunt voluntarily because the industry is simply not commercially viable without massive public funding. Murphy also advocates that harp seals, which subsist mainly on a fish diet, must be culled en-masse to protect valuable cod stocks. Profits aside, he assures us that we must rush to thin out the numbers of the â€œrapacious seals slithering underwater all around [Newfoundland] â€” sucking up every piece of protein the sea has to offer, including of course the king of all food fish, the cod.â€� Aside from money, the argument is made that sealers are performing a public service by protecting cod stocks from ravenous seals. This theory might have been tenable a few years ago, some time before the huntâ€™s most vociferous proponent, the Department of Fisheries and Oceans, publicly announced that it was not the case. â€œThe commercial seal quota is based upon sound conservation principles, not an attempt to assist in the recovery of groundfish stocks,â€� the DFO website states, explaining that â€œSeals eat cod, but seals also eat other fish that prey on cod.â€� These days, however, the cod-saving story is just another debunked fairy-tale â€” like the idea that the hunt is a self-sustaining industry. The fact that Murphy repeats it in the same breath with which he accuses anti-hunt activists of propagating â€œwildly overheated fablesâ€� is an example of the depths to which debate has sunk. The seal hunt is not just immoral. Itâ€™s a drain on the economy. The debate over it is miscast as a balancing of livelihoods against animal welfare; in reality, these two values can easily coexist. When the hunt finally collapses in the wake of the Russian ban, Ottawa will have a choice: continue trying desperately to create foreign markets for an unethical, no longer viable industry, or redirect the subsidies to help Newfoundlandâ€™s economy adapt to the new fiscal landscape. The second choice is, by far, the more rational; the first is, unfortunately, the more likely.